I bought a gallon of apple cider to experiment making the Apple Pie-tini and it was so good, I wondered what other cocktails I could come up with. I thought maybe I should step out of my box and try something that wasn’t vodka based. Maybe something a little different than the norm would be fun. I’ve blogged about a couple rum drinks before, but I haven’t done a tequila one yet so here you go…an Apple Margarita. At first I thought it sounded a little weird but it’s not. 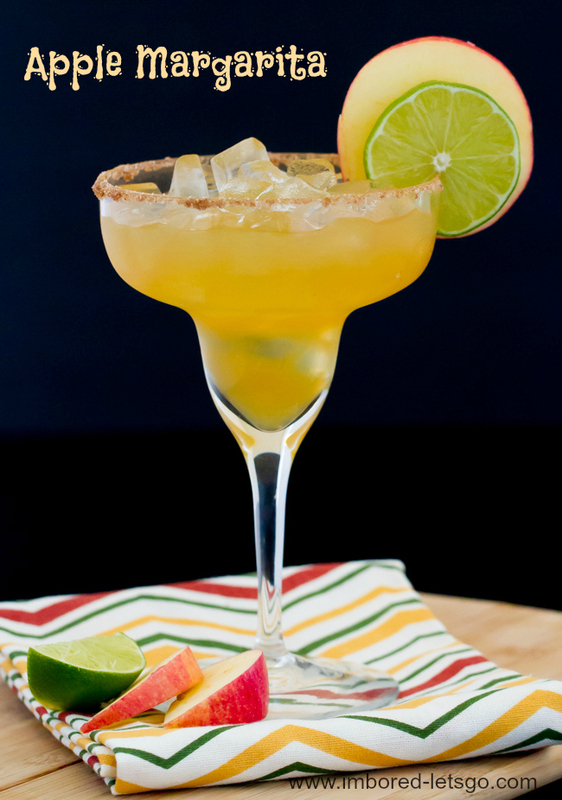 After all, margaritas come in all sorts of flavors like strawberry and mango, so why not apple? In a typical margarita I like to add Grand Marnier, so for this one I just replaced it with apple liqueur. Instead of a sweet and sour mix I used apple cider and some lime juice. It all makes perfect sense…and a really good Fall margarita! Combine tequila, apple liqueur, apple cider and lime juice in cocktail shaker. Shake well and pour into margarita glass (I like to add ice to my glass). If you want to rim the glass, mix a little sugar and cinnamon together, then wet rim of glass and dip it in the sugar mixture.